One would expect a 3D imaging instrument to be able to measure some physical parameter, for example a density of fluorescent molecules, of an object locally. This requires the instrument to detect the signal arising from a limited measurement volume while being insensitive for signals from outside this region. Since the outside region can be very large compared to the measurement volume, the suppression of the outer regions must be very strong. suppressing signal from the surrounding area. Suppose that the sensitivity is only dependent on the distance to the center of the measurement volume (the focus). 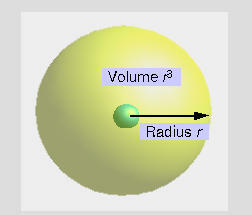 The volume and thus the signal from a sphere of radius r in a homogeneous object is proportional to r3. To counteract the increasing signal from a volume with increasing radius the out-of-measurement (out of focus) signal suppression must be better than r-3!!! In optical Fluorescence Microscopes the situation is more complex due to anisotropy of the image formation, but largely this reasoning remains applicable. signal suppression must be better than r -3. When in a Widefield Microscope (WFM) an object goes out of focus it is blurred, but its total intensity remains constant. The object's maximum value will decrease only as z2, with z the distance in axial direction from the focus. This means that off-focus suppression is insufficient. The WFM has no intrinsic 3D imaging capabilities. A homogeneous horizontal plane can't be imaged or located. 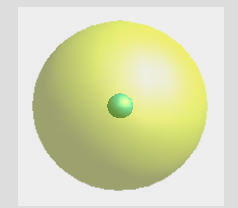 Since the total (plane-wise integrated) intensity remains constant objects below or above the image always contribute. In a slit-scanning confocal microscope the sensitivity decreases as r-3; the decrease in sensitivity is balanced by the increase in volume. A detailed study of this case shows that out-of-focus areas may still strongly contribute to the in-focus signal. In practice, the spatial limitation of most object makes the slit-scanning confocal microscope suitable for 3D imaging. In a Confocal Microscope the sensitivity decreases approximately as r-4. As a result the confocal microscope has intrinsic 3D imaging capabilities. Most Scanning Disk Confocal Microscopes (SDCM) are equipped with Nipkow disks. In an SDCM many, typically 1000, pinholes are used to simultaneously scan the specimen. The resulting images can be seen as a sum of a widefield image and a confocal image. Large out of focus objects will therefore strongly contribute to the in-focus signal, but a homogeneous horizontal plane can be localized. A hybrid between a line scanning confocal microscope and a SDCM also exists: the Olympus Disk Scanning Unit (DSU) microscope. When are 2D 'stacks' volume images? Wide Field Microscopes having non-intrinsic 3D imaging capabilities suffer from severe degradation due to blurred out-of-focus areas contributing to in-focus areas. Microscopes with intrinsic 3D imaging capabilities like Confocal Microscopes suffer from anisotropy in the imaging properties. Especially the axial resolution is inferior to the lateral resolution. In addition, images from confocal microscopes, 2-photon microscopes or widefield images of life cells are often degraded by noise. In all cases it is possible to undo part of the degradation by doing deconvolution.